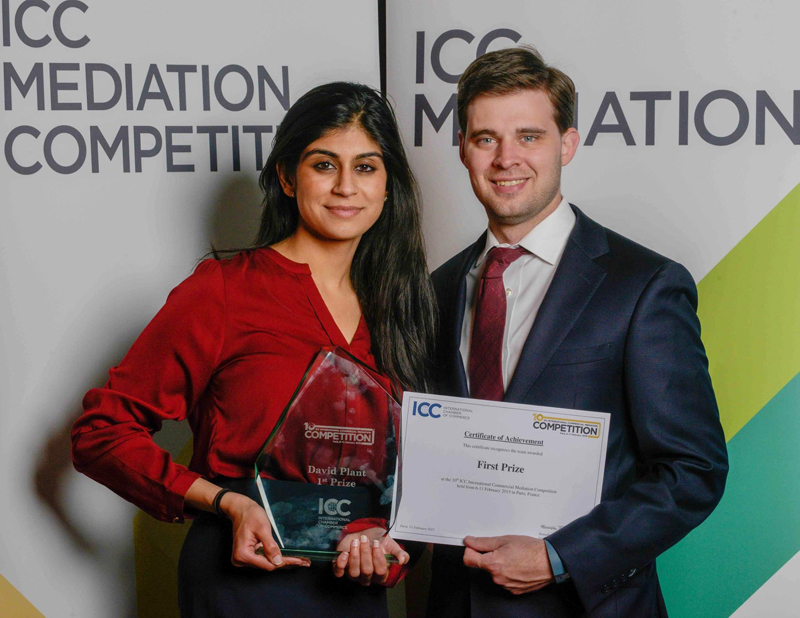 The University of Houston Law Center has won the International Chamber of Commerce (ICC)’s 10th International Commercial Mediation Competition, taking the title after a thrilling final against the University of Sao Paolo. Featuring some 150 mock mediation sessions based on real commercial disputes, the 2015 Competition tested the problem-solving skills of 67 teams from 34 countries, making it the biggest and most diverse yet. University of Houston Law Center was represented by students Brandon Schrecengost and Rose Badruddin, who win internships at the ICC International Centre for ADR, and the Centre for Effective Dispute Resolution, as part of the Competition prize. Houston won the first ICC Mediation Competition in 2006, but has taken 10 years to get a team back into the competition finals. Throughout the competition, professional mediators drew on their own experiences of resolving business disputes to act as mediators and judges, while students played the roles of client and legal counsel. The final session involved a complex dispute over the low yields of a newly acquired vineyard on a South Pacific Island. The Competition has gotten much more competitive every year. It’s invaluable for the students to meet their peers from around the world and interact with them both socially and professionally. Speaking at the Competition finale, Pablo Bernad, Partner, Head of KPMG Risk Consulting in Europe, Middle East, Africa and Southwest Asia, said headline sponsor KPMG was proud to contribute to this “exciting and highly valuable” global event. Brazilian universities did particularly well in this year’s competition, with three of its four participating teams getting through to the final rounds and one winning second place. Jim Lawrence, now a qualified mediator, and a teacher at the Law Center, was on Houston’s winning team back in 2006. The Competition, and particularly its connections between international law and mediation, went on to influence his later career. “Winning the Competition was life-changing,” said Mr Lawrence. Relive highlights of the ICC Mediation Competition on Twitter via #ICCMW @ICCMediation.